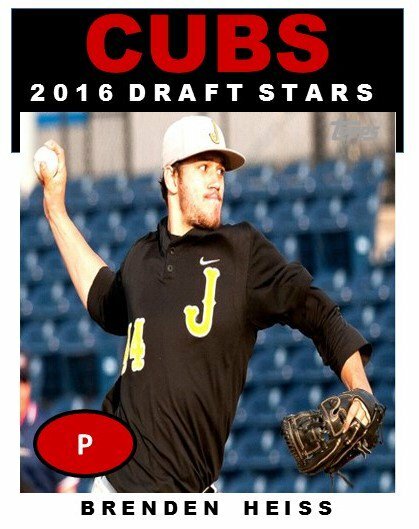 From the time he was drafted in the 31st round of the 2016 draft, Jacobs High School pitcher Brenden Heiss has taken a strange route. Before the draft, he was rated one of the top prospects in Illinois and it was going to take a substantial sum to get him to turn pro. After spurning the Cubs offer, the kid from Algonquin chose to attend the University of Arkansas. Over the next year, things did not go so well. Heiss only saw action in four games at Arkansas, all in relief. He pitched a total of five innings, walked three, struck out three, and had an ERA of 3.60. It’s not uncommon for a highly touted pitcher to work their way up into the rotation in D1 and sometimes it takes a couple of years. Very few players come in and are dominant from the get go. Such was the case of Heiss. When he went to play summer ball, Heiss went to play for Lakeshore in the Northwoods League north of Milwaukee. It did not go well there, either. Like Arkansas, Heiss only saw a limited amount of action and it was in relief. His ERA was over 10 in his two appearances. When the 2017-18 school year started, Heiss was no longer at the University of Arkansas. Instead, he found his way to southern Illinois and John A. Logan College (named after a former Union General from Illinois) in Carterville. He’s made four appearances so far and things seem to be working out very well for the former big-time prospect. For Logan, Heiss has made 4 starts and is striking out batters at an unbelievable rate of over 15/9 innings. Because he is going to a junior college now, Heiss will be eligible for the draft this summer and the Cubs could re-draft him, if Heiss so consents. At 6’1″ and 190 pounds Heiss used to have a delivery that required some effort. That can be toned down at the pro level. Take a look at his delivery, and fastball movement, from two years ago. What I really liked about Heiss as a high school pitcher was he got out a ton of armside run on his fastball at 89-93 mph. The movement he got reminded me a lot of how Carlos Zambrano used to throw a tailing fastball. Many scouts rated his curveball in high school as a plus pitch. I don’t know if there was an injury in there, if there was a conflict, or if he was just struggling, but he seems to have righted the ship. I’m going to keep a close eye on him the rest of the spring. It’s rare for me to follow a junior college prospect. But when you watch the video above, you can see the potential in that run. You can also see the effort, how he throws across his body (ala Arrieta), and how he could easily struggle with his command. Hopefully, that’s all in the past. He could be a nice pick come day two (rounds 3-10) of the draft.